Walking is not just going to the mailbox, but it can be one of the best forms of exercise to keep young. Whether you a new to fitness walking, want to set larger goals, train for an event, or an old pro, this is the site for all levels with hints to make this sport more enjoyable for people over fifty. 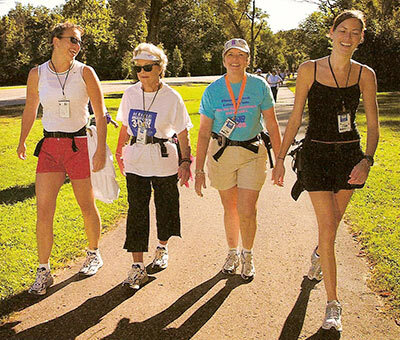 When I started training walkers for the Breast Cancer 3Day, 60 mile walk, I realized that what I took for granted had to be learned by others. You are never too old! Nordic Walking is a simple, incredibly effective path to physical and mental health. No matter how hectic your schedule is, even 30 minutes a day with your portable LEKI Nordic Walking poles challenges your body and clears your mind. No need to stop your walking routine if you travel; take your poles with you. With a pair of poles in your hands, the most basic stroll becomes a surprisingly easy, full-body workout. If you are a runner ready to give your knees a rest, someone looking for posture help, or an active athlete needing another modality for cross-training, Nordic Walking is your Gym On The Go! Email us your favorite walking stories!